EU High Representative for Foreign Affairs and Security Policy Federica Mogherini and Iranian Foreign Minister Mohammed Javad Zarif attend a ministerial meeting on Iran’s nuclear program in Vienna. European nations gave two significant financial contributions in August to recipients that the United States had specifically targeted for decreased funding. The European Union announced on August 23 that it would send more than $20 million in aid to Iran. This move challenges U.S. economic sanctions on Iran, which were reimposed in early August. On August 31, Germany announced that it would significantly increase its funding to the United Nations Relief and Works Agency (unrwa), which deals with Palestinian refugees. The U.S. significantly cut its contributions to that organization this year and may be planning to cut them entirely. Both of these contributions undermine the U.S. Middle East policy under President Donald Trump. In both instances, the U.S. is trying to use financial pressure as an aggressive negotiating strategy. The U.S. wants to negotiate a new nuclear deal with Iran and bring the Palestinians back to the negotiating table with Israel. Europe’s decision to send monetary aid undermines both goals, and Europe knows it. This sends a clear message: Europe is not afraid to take action, even against U.S. policy. The $20 million aid package to Iran probably won’t have a huge impact on its economy, Dr. Emily Landau, a senior research fellow at Israel’s Institute for National Security Studies, told The Media Line. Iran’s economy was already struggling before American sanctions were snapped back in early August. So the aid money is really a symbolic gesture, but it still undermines the U.S. strategy. In the case of the unrwa, however, the money is a desperately needed lifeline. Having lost the support of its largest donor, the organization has been struggling to make ends meet. German Foreign Minister Heiko Maas wrote in a recent letter to other EU foreign ministers that the unrwa is a “key factor for stability” in the Middle East. He said he fears that if the organization collapses because of lack of funding it could create an “uncontrollable chain reaction.” He called on international partners to join Germany in bailing out the organization, which provides services to more than 5 million people that it classifies as Palestinian refugees. So far this year, Germany has given the unrwa about $94.5 million. America cut its contributions from $365 million in 2017 to $60 million so far this year. The unrwa is therefore facing a $217 million shortfall. Maas wrote in the letter that Germany is “preparing to provide an additional amount of significant funds” to the organization, but it won’t make up for the entire shortfall. It has encouraged other EU nations to help create a “sustainable finance basis” for the unrwa. The U.S. and EU’s opposing foreign-policy stances on the Iran nuclear deal have set them on an inevitable collision course. The U.S. has promised to block those who trade with Iran from the U.S. market. Continuing business operations with Iran violates U.S. sanctions and will bring about secondary sanctions. But Europe is circumventing those sanctions. European Investment Bank president Werner Hoyer told the press on July 18 that it would be too much of a risk for the bank to directly invest in Iran. However, the aid package skates around the sanctions and allows Europe to soften the financial blow. The Jerusalem Post called the aid package a “symbolic move” by Europe. The EU also reactivated its “blocking statute” after U.S. sanctions on Iran were snapped back. The “blocking statute” prevents European companies and residents from complying with U.S. sanctions. Any business or resident who wants to stop doing business in Iran must request a permit. That is the opposite of the way it is in America. Under the sanctions, any U.S. business or resident who wants to continue doing business in Iran must ask for permission. Essentially, Europe is telling its businesses to ignore the White House. Neven Mimica, the EU commissioner for International Cooperation and Development, told Euractiv, “With these measures, the EU demonstrates its support to the Iranian people and their peaceful and sustainable development. It encourages the stronger involvement of all actors in Iran and in particular the private sector” (emphasis added throughout). 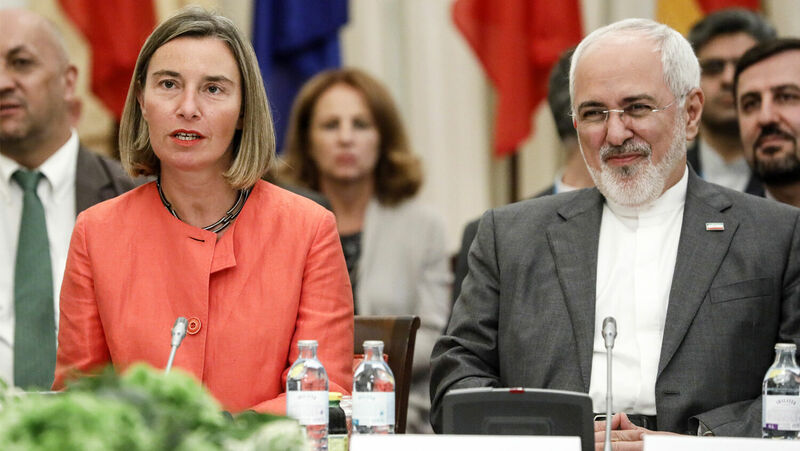 EU High Representative Federica Mogherini said in a statement, “This new package will widen economic and sectorial relations in areas that are of direct benefit to our citizens.” It is significant that the EU is looking to “widen economic and sectorial relations” with Iran while the U.S. has Iran under sanctions. Europe is showing the world that it will make its own decisions, whether the U.S. likes it or not. Both of these U.S. decisions have been unpopular with the international community. Europe is not the only one who disagrees with the U.S. Even Russia condemned America for pulling out of the nuclear deal. The Guardian wrote that the U.S. exiting the nuclear deal and enforcing snapback sanctions has “strengthened calls in Brussels for a looser trans-Atlantic alliance.” Europe is ready to move away from America. In fact, it has already started. Europe is trying to establish itself as the foil for America, the cool head in a crazy world. Guy Verhofstadt, former prime minister of Belgium and a member of the European Parliament, said: “This shows yet again why we as Europeans must strengthen our foreign policy to be able to shape relations with the greater Middle East independently from the U.S.” Traditionally, America has been the leader in the Middle East, and Europe has followed after its ally. But now Europe wants to be able to “shape relations” with the Middle East on its own terms. Europe is prophesied to take the dominant role in the Middle East in the end time, especially in the Israeli-Palestinian peace process. The Bible even tells us that the modern nation of Israel is going to turn to Germany for help in solving its “wound,” which Trumpet editor in chief Gerald Flurry identifies as the peace process in his booklet on Hosea. Mr. Flurry wrote in the December 1996 Trumpet: “Europe is moving not only to be a cosponsor in the peace process—they want to gain control of it!” Europe, led by Germany, will come into Jerusalem as a peacemaker, but then it will double-cross Israel (Hosea 5). As America turns inward, we can expect Europe to take a more dominant role in Middle East politics. These events in August also show that the chasm between these two former allies, Europe and America, is widening. This is also prophesied. Ezekiel 23 contains a prophecy about end-time Israel—primarily Britain and America—being double-crossed by their former “lover,” Germany. Mr. Flurry wrote in the September-October 2000 Trumpet: “The U.S. trusts Germany—our lovers, as Ezekiel calls them (Ezekiel 23:4)—more than we trust God! That could be the worst foreign-policy mistake we have ever made—or ever will make.” The love affair between Europe and America is ending, and we are watching it happen. To understand more about this subject, read “Donald Trump Brings Bible Prophecy Alive in Jerusalem” and Mr. Flurry’s free booklet Jerusalem in Prophecy.